The Ruler Company is fully committed to supplying hardwearing and accurate rulers for anyone who needs them. We understand how important rulers are in day to day life. It's not just children who need them, as people of all walks of life and in various industries require high-quality rulers to draw accurate lines and take precise measurements. A ruler is, therefore, one of those indispensable items you need in your pencil case, work bag or even briefcase. If you are looking for an incredibly accurate, portable measuring implement, look no further than this 30cm/300mm Dead Length Wooden Ruler available to buy right here from The Ruler Company. It has a very simple design and thanks to its small size, is ideal for slipping inside your pencil case, bag or briefcase. It is even small enough to fit in most desk tidies. Crucially, it has been constructed to provide you with incredibly precise readings and measurements and features numbers ranging from 0 to 30 on the front, graduated in mm and 0 to 30, graduated in 0.5cm on the back. 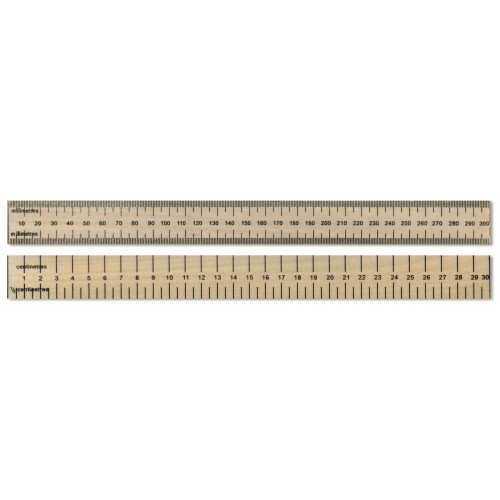 All rulers stocked at The Ruler Company are made from robust and durable hardwood (unless otherwise stated). We have designed them to cope with regular use and thanks to the high-quality materials we use, they are less likely to snap or break than their plastic counterparts. So, whether you are a student at school or college, or work in a field where accurate measurements and straight lines and other shapes are required regularly – we believe our products, like this 30cm Dead Length Wooden Ruler, are smart investments.